Since its founding 52 years ago, the New York Film Festival has been devoted to international auteur cinema. In the first year I covered the festival, 1980, the highlights included Jean-Luc Godard’s "Sauve qui peut/la vie" and François Truffaut’s "The Last Metro," indications of the importance of the French New Wave’s aesthetics and auteurs to Richard Roud, who guided the festival’s selection process for its first 25 years. During Roud’s tenure, the festival’s orientation was decidedly Eurocentric. But this was also a period during which, arguably, much of the most compelling non-U.S. auteur cinema was coming from Europe. By the time I moved to New York, in 1991, much about cinema had changed and so had the festival. Under its new selection committee head, Richard Peña, who began his own 25-year stint in 1987, the festival significantly broadened its geographic focus, welcoming films and new auteurs from such previously little-seen locales as Iran, China, Egypt, Turkey, Romania, Mexico, Africa and South America. French cinema (and aesthetics) was still a prominent presence, yet the Peña years were distinctive and valuable for representing how shifts in global culture were reflected by cinema. It has only been two years since Kent Jones took over from Peña, and on the evidence so far, it might be tempting to think that the festival is shifting from a globalist perspective back to a more Eurocentric one. This year, for example, there are no main-slate films on view from Russia, China, Iran, Turkey, Mexico or North Africa, among other still-active cinematic hot spots. Yet it will surely take a number of more years before a comprehensive pattern can be discerned. The festival’s very selective main slate only contains around 30 titles, and selection committee members say they make their choices on a film-by-film rather than a geographic basis. One reason I’m inclined to believe that a more European emphasis this year might be appropriate is that the most astonishing film I’ve seen in two weeks of festival press screenings might be called an apotheosis of European culture. Ironically enough, it comes from an American expatriate. Like Henry James, T.S. Eliot and Ezra Pound before him, native New Yorker Eugène Green moved abroad in the 1970s and became, it would appear, more European than the Europeans. Based in Paris, he founded a theater company dedicated to the revival of Baroque theater. Since 2001, he has made two shorts and six features, the latest of which, "La Sapienza," is the first to play the New York Film Festival and to receive American distribution (by Kino Lorber). A dazzling if unabashedly eccentric work of art, "La Sapienza" (which plays today, 9/27, at 3pm and tomorrow, 9/28, at 12:15pm) has a style that’s immediately striking but so anti-realistic that some viewers may be tempted to laugh at first. Green’s compositions are exceedingly formal and often symmetrical; there’s no clutter anywhere; the lighting recalls old studio movies; characters move in very controlled ways and speak directly to each other or (in p.o.v. shots) the camera. In some ways there’s a resemblance to the studied mannerisms (and spiritual concerns) of Robert Bresson, yet with a kind of theatrical ebullience that also recalls Jacques Rivette and late Jean Renoir. In an allegorical tale that meditates on architecture, art, music and history, Green follows a geographic itinerary that evokes the convergence of France and Italy that gave us Europe’s two greatest post-World War II cinemas but also stretches much further back in time. In Paris, an architect who’s very unhappy with his current work decides to go to Italy and try to revive a book about his Baroque Italian antecedent Francesco Borromini that he put aside many years before. On the shores of Lago Maggiore, he and his wife encounter an Italian-speaking brother and sister in their late teens. The girl has unexplained fainting spells. When the wife discovers the boy wants to be an architect, she persuades her husband to take him along on his voyage through Italy in quest of Borromini’s masterpieces while she remains behind and tends to the girl. Thereafter, the film shifts back and forth between the two sets of characters as a delicate form of communion unfolds in each. Both the architect and his wife, we learn, have suffered tragedies that have left them wounded, guilty and cold. Interacting with their young charges brings them back to life through caring and mentorship. For the wife, this means telling the girl about the blow that has left her marriage desiccated. For the architect, it’s recounting for the boy the story of Borromini’s tumultuous life–a distant reflection of his own–as they traverse Italy looking at his buildings, which are sumptuously photographed as supreme icons of beauty and spiritual expression. The architect explains the intense rivalry between Borromini and Gian Lorenzo Bernini. The latter’s art, he says, is highly rational while the former’s is mystical. Again, the man is telling his own story. He feels his own work is like Bernini’s though he continues to aspire to Borromini’s mysticism. In conveying all this to the boy, he seems to rekindle a passion and a determination that had been smothered by his adult life’s difficulties. A film of several distinct tonalities, "La Sapienza" takes some droll satiric swipes at the idle rich in Rome and pokes hilarious fun at Aussies trying to bluster their way into a locked chapel. In one scene, Green himself appears as a French-speaking Chaldean Christian who’s been chased from Iraq by the American invasion. Ultimately, though, the film is an impassioned and strikingly original argument for the coherence and value of life and the redemptive powers of art. It’s not just Baroque architecture and music that possess such powers, of course. Implicitly, Green is vaunting cinema’s own inspiring and transformative capacities when practiced at its highest levels. In so doing, he joins others who appear eager to revive the potency of Europe’s artistic cinema. Like Paolo Sorrentino’s "The Great Beauty" and Pawel Pawlikowski’s "Ida," "La Sapienza" evokes masterpieces of decades past while confidently charting new territory of its own. A work of exaltation and profound vision, it deserves to move Green to the front ranks of European auteurs. In the festival’s early years, Hollywood had little place. But that has changed in recent times as the bling of celebrity culture has grown increasingly important to even some of the most august cultural institutions. Continuing a recent tradition, the 2014 festival opened with the world premiere of a highly anticipated major-studio release that brought stars to Lincoln Center. 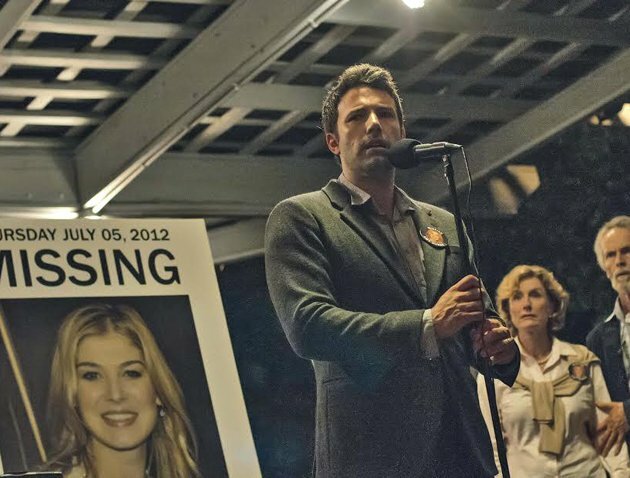 It’s arguable, though, that the real star driving interest in "Gone Girl" was not its lead actor, Ben Affleck, but the combination of director David Fincher (whose "The Social Network" opened the festival four years ago) and the bestselling novel by former Entertainment Weekly TV critic Gillian Flynn, who also penned the movie’s script. Having made films such as "Se7en," "Zodiac" and "The Girl With the Dragon Tattoo," Fincher is certainly an auteur with great credentials in the dark crime drama department. Here, he does his usual expert job, with the result that the film will likely earn a fair amount of critical respect as well as bountiful box-office rewards. The big drawback is that the material he’s working with this time comes off as notably inferior to that of his previous thrillers. While gripping and imaginative, the narrative of "Gone Girl" ends up feeling rather silly and awkwardly contrived. It is best in its early sections, which set up a mystery that’s both believable and compelling. On the day of his fifth wedding anniversary, creative writing teacher Nick Dunne (Affleck) returns home and finds his wife missing and evidence of violence in their home. The police are called in, and, as the case makes its way into the news, not only does a media circus begin to brew but Nick increasingly falls under the suspicious gaze of tabloid newscasters looking for a villain. Did he kill his wife? He can’t say no enough times to quell the doubts of a scandal-hungry world. As we learn in flashbacks–which interestingly interweave Nick’s spoken recollections with written accounts by his wife Amy (Rosamund Pike)–the couple met in New York, where they enjoyed a good life until both lost their jobs in the recession and decided to move to his native Missouri. There, their previous happiness began to curdle and discontent to set in. Also, Nick commenced some philandering that, when discovered, only fuels the suspicions of those looking for reasons he might have had to kill Amy. Through these parts of the story, Fincher’s precision-tooled direction (aided by the burnished imagery of his usual cinematographer Jeff Cronenweth) and the strong performances of Affleck and the other actors deliver a drama that’s steadily engrossing and essentially credible. In the tale’s second half, though, the whole enterprise tiptoes out onto a slippery slope leading downward toward unintended absurdity, and its earlier surefootedness falters. It get wilder, and bloodier, and more delirious. The surprises and plot twists come fast and furious, so our attention is held. But what had been nuanced and fairly realistic steadily grows more outlandish and fantastical. Viewers may well question some of the more unseemly story elements. Yet the narrative twists are less politically objectionable than simply an indication that "Gone Girl"’s ambitions belong not the realm of art but to a certain ilk of pulpy entertainment. Due to that, it’s likely to end up near the bottom of the aesthetic ladder at this year’s New York Film Festival. Next Article: NYFF 2014: Films Help Define a Cinematic World in Flux Previous Article: NYFF 2014: Help Us Out New York!